The Canada Summer Jobs program provides over $200 million per year to fund some 70,000 students with seasonal employment. Just before Christmas, Prime Minister Trudeau changed the requirements for funding which now demands that applicants and employers sign a document to attest that they support women’s reproductive rights, and the rights of gender-diverse and transgender Canadians. No Bible believing Christian should swear support abortion or multiple genders. This thinly veiled discrimination truly means Christians need not apply. It is very sad that children will be hurt by Trudeau’s ideological test as their favourite camp worker may be rejected for not swearing to support abortion. It is troublesome to think of the thousands of Christian students will lose their summer jobs – jobs they depend upon to pay for fall tuition – for simply having a different view on multiple genders. The Prime Minister has no right to force young people to bow to his unconstitutional decrees. “I was tortured for my beliefs as a 17 year old student in Ethiopia. I escaped to Canada for freedom, only to hear my government say you cannot have a job because of your beliefs. Please do not discriminate,” says Efrem Leakemariam. 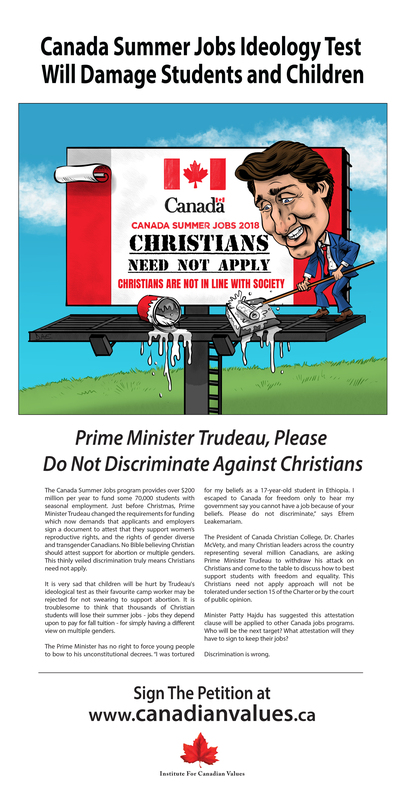 The President of Canada Christian College and many Christian leaders across the country representing several million Canadians are asking Prime Minister Trudeau to withdraw his attack on Christians and come to the table to discuss how to best support students with freedom and equality. This Christians need not apply approach will not be tolerated under section 15 of the Charter or by the court of public opinion. Minister Patty Hajdu has suggested this attestation clause will be applied to other Canada jobs programs. Who will be the next target? What attestation will they have to sign to keep their jobs? The Institute for Canadian Values is a national think-tank dedicated to advancing knowledge of public policy issues from Judeo-Christian intellectual and moral perspectives, as well as building awareness of how such perspectives contribute to a modern, free, and democratic society. The Children’s Emergency Protection Fund (CEPF) is a program of the Canada Christian College / Institute for Canadian Values, a federally incorporated non-profit organization and a registered Canadian charity. CEPF partners with programs to help children in serious need across Canada. We believe in trying to help any child in extreme need regardless of race, religion, language or culture. CEPF is dedicated to protect children from hunger, poverty, and sexual abuse. CEPF is funded entirely by the voluntary contributions of individuals, businesses, and foundations. Be the first to know with urgent updates on current issues by email. Free one year subscription to the Evangelical Christian Magazine. 20% discount off all DVD or Books. 6. 20% discount off all conferences or seminars.